Well, you had me at the title. I have a keen radar for sniffing out anything football (soccer)-related as I consider football to be one of the greatest joys known to human-kind. From reading your review, my initial disappointment at the lack of on-pitch action was replaced by intrigue at what does sound like a contemporary take on Camus’ ‘L’Etranger’. It does sound really fascinating. It is one of those books that can get under your skin. The movie plays out the soccer aspect more explicitly and was written by Handke (who has gone on to collaborate with Wenders on films like Wings of Desire). I found a rather blurry copy on Youtube. I enjoyed your review of a book I know well. 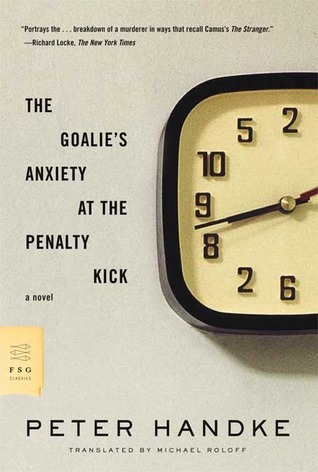 Just a couple of thoughts: for me, that final scene as he watches the goalie and the penalty kicker stands for the whole set of thoughts about language and meaning you lay out so nicely. Because the connections between words and things are largely conventional, they are, if we think about it carefully, a bit slippery. The sign the penalty kicker gives is meant to deceive and the goalie knows that and the kicker knows that the goalie knows that and on and on. The lesson Bloch and the reader get when the goalie just stands there and the ball hits him in the chest is … well, what is the lesson? The book has the form, in a way, of a detective or crime novel, with an early crime followed up by by an investigation. We’re in the mind of the killer, not in that of the police, but we get hints through the papers Bloch reads that the police are following a set of clues and getting closer to him. The clues are language of a sort, and in the conventional crime story the detective finds the perpetrator. Meaning is certain. But in this novel, at one point, Bloch compares a map with the scene below him and finds they don’t match and breaths easier. Meaning is uncertain and if that’s the case the clues he has left behind may be uncertain as well and he’ll not be found out. That’s one way to read the novel. Your connections between Bloch and people you have worked with is probably a more powerful way to read it. Wenders and Handke made a short movie before The Goalie’s Anxiety called “3 American LPs.” And Wenders has just filmed Handke’s play The Beautiful Days of Aranjuez, with Peter’s wife Sofie as one of the two characters. Thank you for taking the time to respond so thoroughly Scott. I was a little anxious about your response to my reading of the book which I will admit is just one of the many possible readings that occurred to me. However, as you know, we cannot help but bring our own experiences to a book – especially one as opaque as this. I agree with you regarding the final scene but for the purposes of a review like this I only wanted to allude to the ending, leaving it open to an interested reader to approach it on his or her own terms. This is the type of read I love – one that leaves room for interpretation, exactly the sort of thing that frustrates the more concrete minded reader. I entered in this book with little advance knowledge, it is the first Handke novel I have read and not one that I had on hand. However, I am preparing to review a Brazilian novel called Quiet Creature on the Corner for Numéro Cinq and there is a limited amount of information in English on the author (Noll) or the book because few of his works have been translated to date, and one of the blurbs quoted suggests it is like “Werner Herzog writing a hypnotic sequel to the Goalie’s Anxiety”. What? Well I thought I would read the Handke first. Unfortunately it has proved to be very unfair to the poor Creature which really bears little resemblance to Goalie’s Anxiety. But the latter was so dominant in my imagination that I will have to wait a week before going back for a second reading of Quiet Creature in advance of writing my review! As I may have mentioned before, my only experience of Handke is Repetition, which I found rather dull – I rather wish I’d read his most famous novel first. Your review certainly encourages me to do so. I’m glad to hear you’re reviewing Quiet Creature – one I already have picked out to read! I certainly enjoyed this, it’s fascinating to watch his thinking deteriorate. It is like having an interesting window on a character’s mind, especially one who’s behaviour is rather odd and inexplicable. Quiet Creature is a book I am still getting my head around. Some of the hyperbole in the promotional material is misleading in my mind. It does disservice to what is really interesting, at least as far as I can see. I need to reread it first. Sometimes I think it is unfortunate when reviewers need to evoke other artists or writers (Kafka and Camus are classics for this). I’ve certainly been thinking about it a lot after my first reading. The review will go live sometime in May, but of course I’ll link it here.